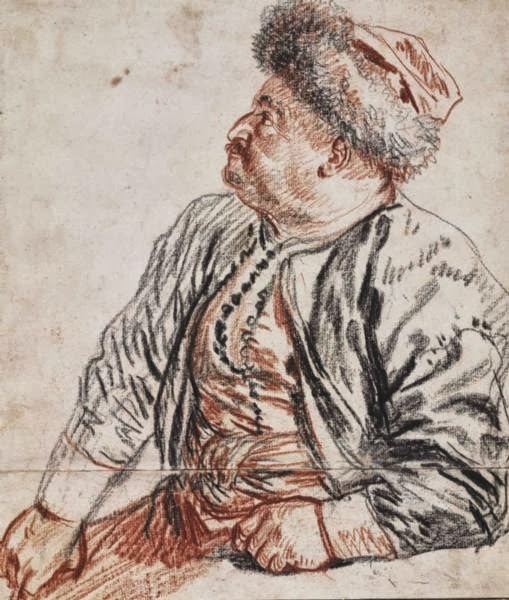 During the Persian ambassador's six-month stay in Paris, Watteau produced a number of fine drawings of members of his entourage in red and black chalk. There is no information about the exact circumstances under which they were created, though 18th-century annotations always state that they were "from life". 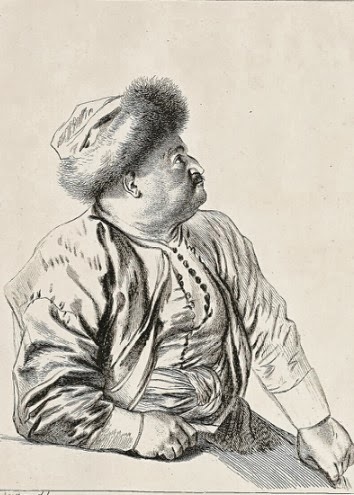 Details of the costumes - the cloak, the breeches and shoes of the servant - have occasionally been disputed, and it is sometimes said that Watteau used models rather than "real" Persians. 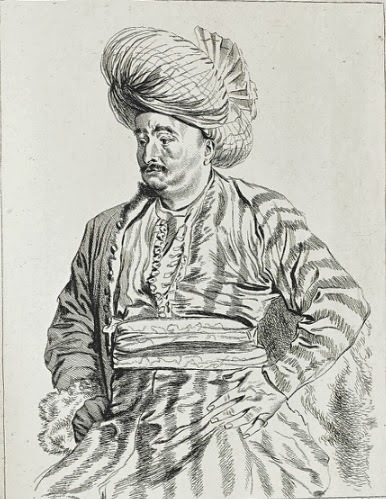 However, he was a close friend of Antoine Coypel, (painter of the Versailles reception) and could well have arranged for individual Persians to pose. 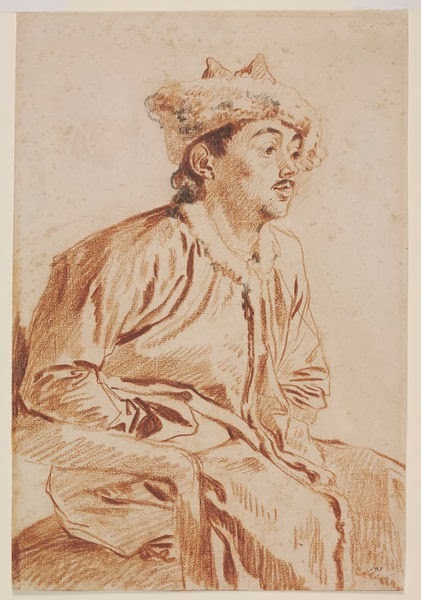 The drawings were created as finished studies rather than preliminary sketches for paintings and are normally grouped with a set of "Savoyards" of the same period as modern character studies. The exact details of how many exist and where is difficult to unravel without access to the full catalogues. According to the Louvre there were nine drawings - seven in red and black, one in red only and a final one in trois crayons (ie. red, black and white). A set of six were later engraved by Boucher as part of Jean de Jullienne's collection of engravings after Watteau, Figures de différents caractères (the "Recueils Jullienne"). 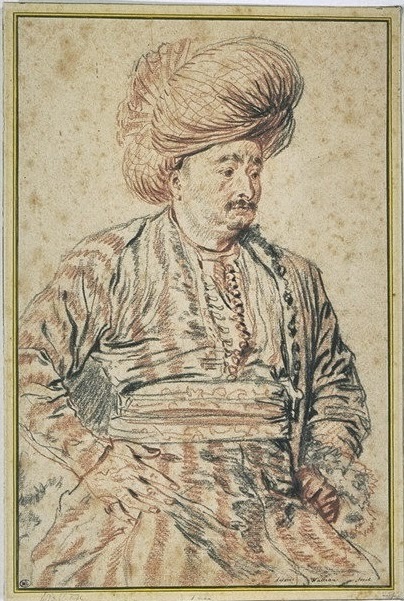 An old annotation on the back of this drawing identifies the sitter as Mehemet Reza Beg himself, clearly a mistake to judge by other depictions of the slight and bearded ambassador. This individual clearly fared rather better on the Persian diet! Note though the man with a very similar moustache in Antoine Coypel's picture of the embassy's presentation at Versailles. This picture looks like the same man. The fur cap is certainly authentic - the ambassador is wearing one in the Coypel miniature (where it contributes greatly to his surprised air). This second model is a more slender, almost feline, young man. It is thought that the two drawings were once part of a single sheet of studies. Finally, the disputed Persian servant. I don't know about the costume, but such serving men were certainly a conspicuous feature of the ambassador's entourage. Website to accompany the Louvre exhibition Antoine Watteau et l'art de l'estampe: recueils Jullienne, which includes a full e-version of the volumes of engravings after Watteau. 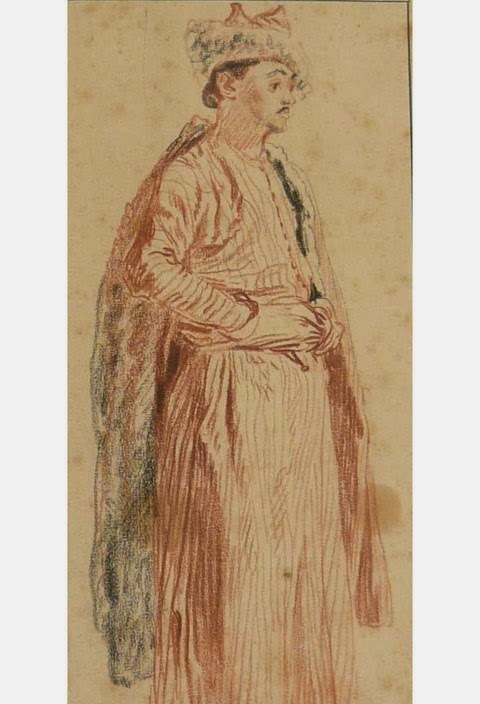 Study guide to the Royal Academy Spring Exhibition 2011 Watteau: the drawings. Contains a detailed discussion of the Louvre Persian. 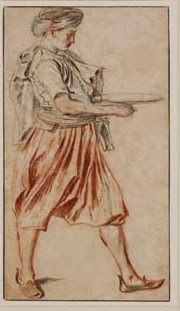 Notice of a drawing sold by the San Francisco Museum of Modern Art at Sotheby's in 2007.
http://www.sothebys.com/fr/auctions/ecatalogue/lot.pdf.N08281.html/f/69/N08281-69.pdf This is the drawing with white as well as red and black chalk, and features the same two models.